Eases Colic cold, cough, sunburns and chest problems. Anti Viral, Anti Septic and Insect repellant. Helpful for Diabetic patients, Babies and pets. Eucalyptus Oil is fresh, medicinal, woody, earthy. Eucalyptus has long been used in topical preparations such as liniments and salves. Cineole is the major constituent. 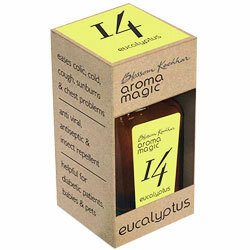 Eucalyptus Oil acts as a purifying, invigorating Antiseptic, analgesic, pesticide.